Happy new guitar day andy!!! That is a mighty fine obg reissue and what a beautiful top...Really nice colour, never seen one that looked like yours. I am really happy for you man!! Hi Mojo, sorry I didn't get back to you on MLP. It is in fact a veneer, but it's such a tasty colour and figure, I think I can live with it. It's such a nice guitar to play and feels a bit more "put together" than my Burny (which I have just sold locally). 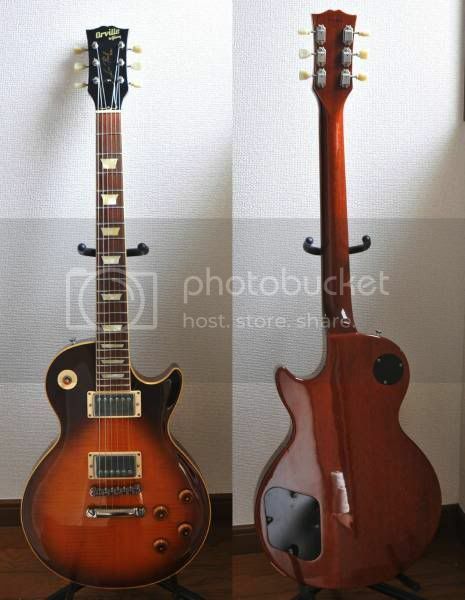 Lovely neck profile as well, a 59 sort of thing. Awesome and even without a pickguard and more important without a hole ! That's fantastic,congrats for this beauty. Thank you everybody for the (generally) positive comments. It makes me laugh when people are snobs about veneer tops. As villager says, solid topped ObGs are so very rare, you are welcome to waste hours of your life hunting for one and then pay over the odds to get it in your hands. Be my guest. Come on dude, I was being sarcastic. Mainly refering to my own sillyness of prefering solid over veneer. Kind of like Monty Python. As I wrote, its a good looking Lester and I still think so despite I don't like veneer. I don't spend hours of my life hunting guitars, I pay people to do if for me! Anyways, let me clarify, I was really joking about the veneer thingy. If I wasn't I would not use emocons. As seen in this text!